Bangkok’s big birthday was in 1782. Before that, it already existed, but was really a negligible place – in 1782 though, it got turned into the new capital of the country. This was also the founding year of the Rattanakosin period under the rule of the Chakri dynasty – the same dynasty that’s on the throne till this very day. (Today, it’s the ninth king of the Chakri dynasty who is in charge, and he is deeply beloved by the Thai people). It was King Rama I who moved the seat of the capital from Thonburi to what is now Bangkok. He was also responsible for the construction of the Grand Palace and many other architectural and cultural feats of Bangkok. 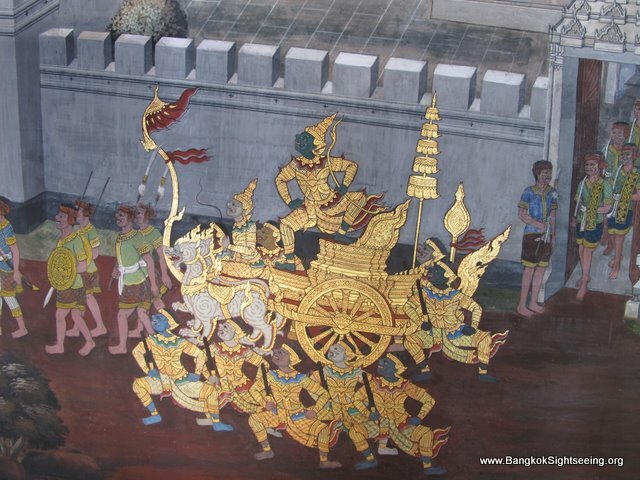 The first King who reigned in Bangkok was also a talented poet and artist, and it was him who commissioned the murals on the walls of the Grand Palace, which depict scenes from Thailand’s national epic, the Ramakien. This is a fascinating story – a modified version of the Indian Ramayana – and if you want to learn more about it, it’s best to book a cultural Bangkok sightseeing tour. A myth filled with creatures from another realm, where magic powers and spells turn the story in captivating ways. It’s the story of the fight between good and evil, and the monkey warrior Hanuman, and it’s a story filled with romance and love. One of the things that is most fascinating about Bangkok is how it has changed over the years. Where you now find modern skyscrapers, luxury hotels and congested roads there have been rice paddies and rivers not too many years ago. It is a city that has expanded and grown really quick. Officially, there are now 9 million people living in Bangkok – but 12 million is a much more realistic number if you count for all the people who migrated here from the countryside without officially registering in Bangkok. Next post: Cinema in Bangkok?